We rolled out our brand new modern company website a couple weeks ago, and the response has been fantastic. As part of that rollout, we also updated the appearance of our blog to match our main web site. 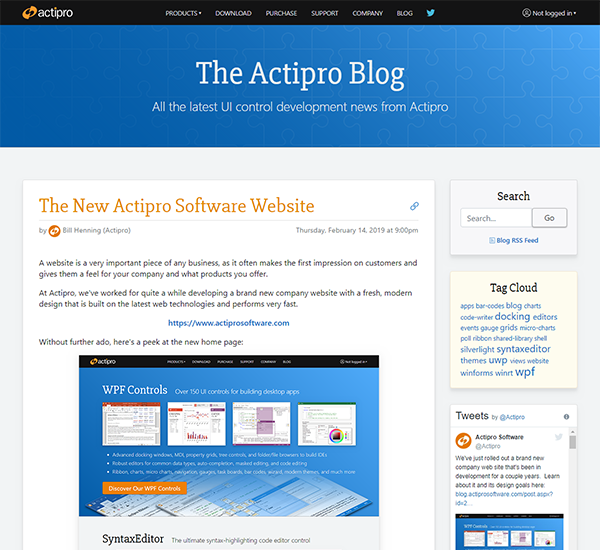 Our blog was previously hosted using a third-party web app (the classic BlogEngine.NET) on a separate blog.actiprosoftware.com sub-domain. While that web app has served us well, it was time to move on. One thing we've wanted to do for a long time was eliminate the use of a third-party web app for the blog, and merge the blog right into our main company website. I'm pleased to announce that today we’ve accomplished that goal. The primary benefit of this change is that it’s now easier than ever for you to comment on blog posts. 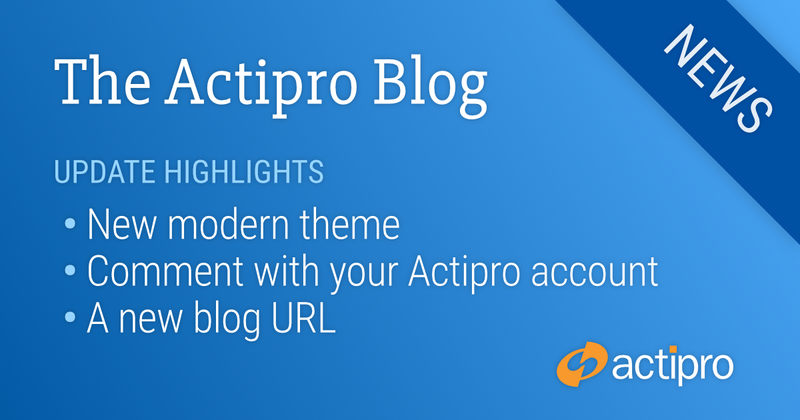 Simply sign into your normal Actipro website user account and if you’ve performed the e-mail validation (you’ve already done this if you post in our discussion forums), you’re ready to post in the blog comments. It’s a very seamless experience. Another benefit is that the new integrated blog uses the same powerful comment editing mechanism as our forums. Comments used to be limited to plain text in the old blog. The new blog comment editor fully supports rich formatting, code snippets, etc. A website is a very important piece of any business, as it often makes the first impression on customers and gives them a feel for your company and what products you offer. 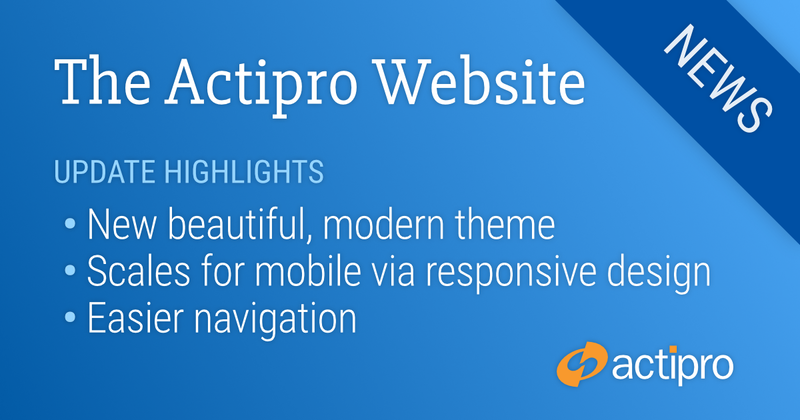 At Actipro, we've worked for quite a while developing a brand new company website with a fresh, modern design that is built on the latest web technologies and performs very fast. A main goal was to ensure the web site was fully-browsable on any device, everything from large desktop screens to tablets and phones. A lot of thought has been put into the site's responsive design, so that it's beautiful on any device. We've fully embraced the use of numerous colors in our website's theme, that all blend together in harmony. Websites shouldn't simply be static content. The use of animations can breathe life into a page and keep the end user's interest. You'll find that we use a number of quick, subtle animations throughout the website. Simplifying our product presentation was another goal. For product pages, we reduced the amount of verbiage and increased the number of screenshots. We've worked hard to relay interesting facts about our products, while enticing you to take the next step and download free evaluations to learn more. A website should be easy to navigate. Large buttons guide you through where to go, page by page. Or use links at the header and footer to navigate to other sections of the site. We wanted the new website to render much quicker than in the past. And we achieved that. This new website is built on the latest ASP Core platform and is extremely fast. The blog should match the design of the main company website, so we've updated this separate blog site's appearance to match thematically. Now that the new website is out, we invite you to have a look around. Please contact us if you have any comments, questions, or suggestions for improvement. We'd love to hear your feedback! 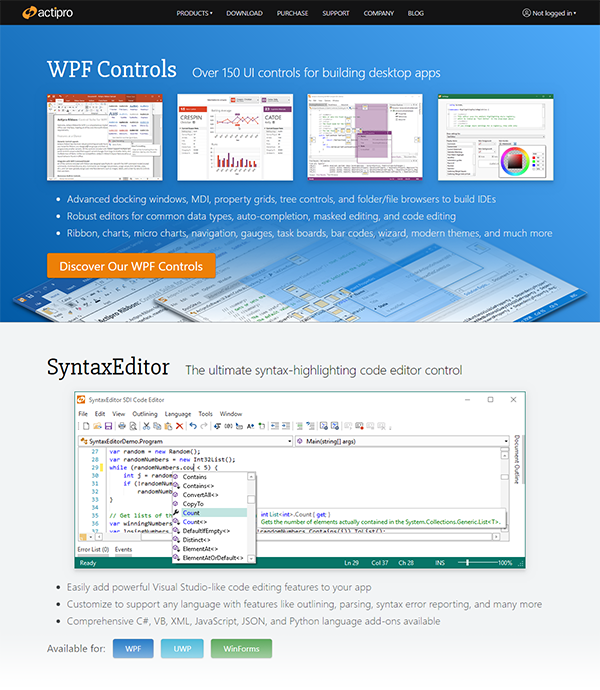 The past three weeks or so, we've been plugging along on refactoring a lot of the internals of SyntaxEditor's IntelliPrompt UI features so that the same codebase can be shared across the WPF, UWP, and WinForms platforms. 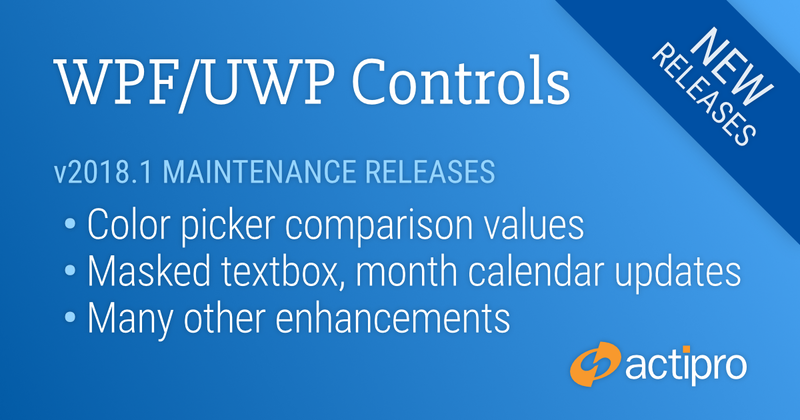 While the WPF and UWP version's APIs are pretty much staying the same (with a couple minor tweaks to completion filters), the WinForms version will see some massive new capabilities, especially with completion. Let's dig in and see a visual summary of some amazing completion list features that will be available in the all three SyntaxEditor vNext platforms. This video shows the WPF SyntaxEditor editing a Python document using our advanced Python Language Add-on. The completion list allows for toggle button and tab filters to be added. Toggle button filters allow you to check the kinds of items you wish to see in the completion list. If nothing is toggled, then all results are displayed. Tab filters let you select between two or more main options, with one being an "All" option. While the current WPF and UWP versions already support toggle button and tab filter UI, this is a new feature for the WinForms version. And in vNext, the toggle buttons work more like they do in Visual Studio 2017. As you type, the completion list filters out items that don't match. This is an option already available in the WPF/UWP versions, but is new for the WinForms version. When typing text, the letters in each item that match will be highlighted in the list. This feature makes it clear why an item is matched and is especially useful when not filtering unmatched items, or using some more advanced item matcher algorithms like acronym or shorthand. This feature is already available in the WPF version, but is new for the UWP and WinForms versions. As described in this previous post, the Python Language Add-on is new for the WinForms version of SyntaxEditor. We've also updated the IntelliPrompt completion in the add-on to dynamically show toggle button and tab filter UI based on the items that are present. For instance, in the animation above when there were no classes available in the list, there was no "Classes" toggle button in the UI. As described in this previous post, the WPF and UWP Metro icons used in IntelliPrompt have been drawn from scratch as vector icons and will render crisp and clear on any high DPI monitor. The WinForms version is getting Metro icons as well, whereas they only had Classic icons before. We have IntelliPrompt completion, parameter info, and quick info completed for all three platforms. Next is to knock out code snippet UI and then all IntelliPrompt features should be about done.